Happy new year, everybody! My new year's resolution: More cowbell. I went ahead and made two ornaments this year because I figure twelve years is a long ever lovin' time to wait for the complete set. *No, that's not a typo up there in the title. It really and truly is colly bird. all your gifts are very cute! congratulations and thanks for sharing!! Wow! I always marvel at your craftsmanship. The detail you add is amazing! These are beautiful! The recipient is one lucky lady! Happy new year to you too ........ these birds are very nice! Like the rest of your work tuti handmade. Any chance you might consider doing patterns for these? I adore the chicken and would love to try to emulate what you have done. Perfection. Wow! I love every detail! Beautiful!! These are so amazing! 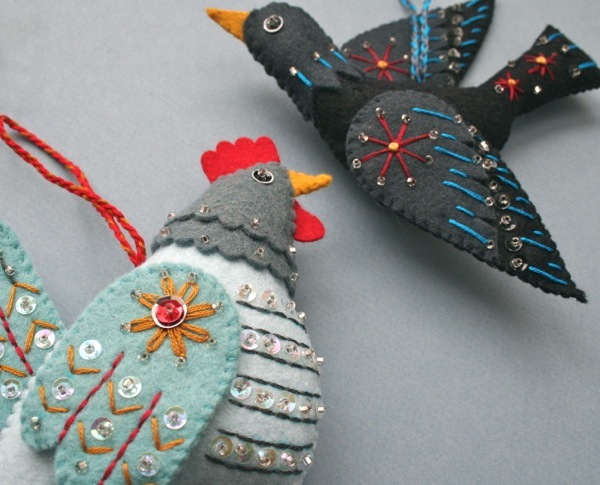 I love the 12 days of Christmas and I love all the ornaments you have made so far! I would love it if you ever decided to make patterns for these! JUST lovely! You have done a beautiful job. And colly birds you say? REALLY? I never knew! Would that I were the happy recipient of these beautiful ornaments. Well done - as ever! 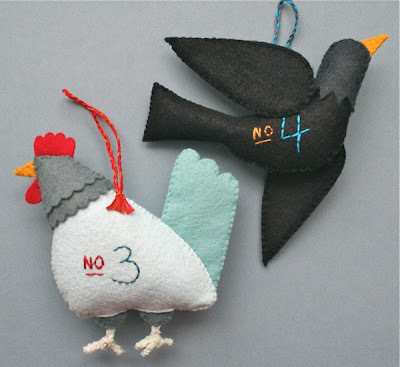 Love the feathery fowl you made is year. They are beautiful! When when when will these be available as patterns? I LOVE these! That's a resolution I could live by! Hey, y'all. So sweet, thanks a bunch. In answer to the question 'when will this be a pattern' I have no definitive time. I have a pdf pattern as a goal, but can't decide if I will finish the series first before releasing the pattern or if it will be better to issue the pattern in collections of two or three ornaments a piece. that idea seems to make more sense, at the speed I'm going. I always thought they were "calling birds"...good to know the truth :). I love the 12 days of Christmas ornaments that you're doing. They are all so wonderful. And what a fun set that will be, eventually ;). Happy 2012! I hope you and your family are well and wonderful. Have a great one! Best. New Years. Resolution. EVER. Hey, guys, thanks so much. I'm so behind in my own set now. I'm missing day one and day three. pink, thank you! yes, the more I think about it, the more I think that's the way forward. Yes. Took. Forever. But only because I have to figure it all out as I go along and build in time for design remorse. If it were a pattern you could just skip all the sketching, second guessing, redos, the endless felt staring and the ripping out of sequins. Much quicker. I love your birds! Found them on Pinterest! Love how you have numbered them too. Cute! I am guessing you did NOT give permission for this to be used on his family holiday net site? Hi there, you are right. I didn't give him permission to use that or any of the many other images from my blog that I found on his site. All of which he is using without any credit or link back. Thanks for bringing it to my attention! hello! 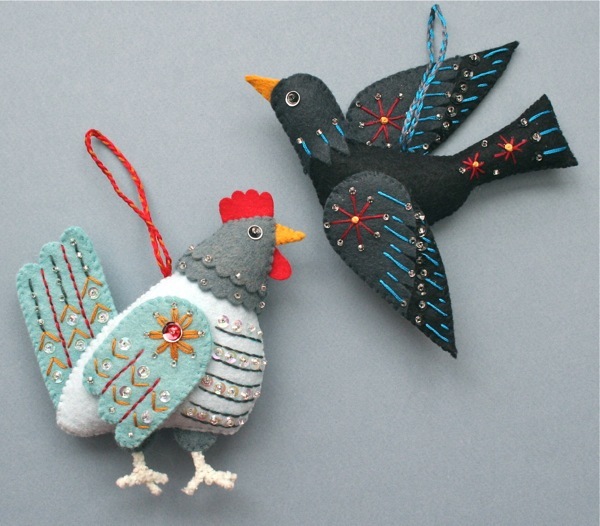 have you published a pattern for the lovely French hen yet? I would love to gift my sister with one. Cheryl, it's still on the list. The list is REALLY LONG. LOL. I wish I had more time in the day! Thanks so much for your reply Larissa. Please let me know if and when you print this pattern.. I just love it! You are so incredibly talented! Just putting in my vote that you should make these into patterns too. I really want to make them all. Even though I haven't seen them all yet. They are wonderful. Skooks, thanks! I'd love to get to it! So many ideas. So little time! my felty valentine: a deal and a contest!